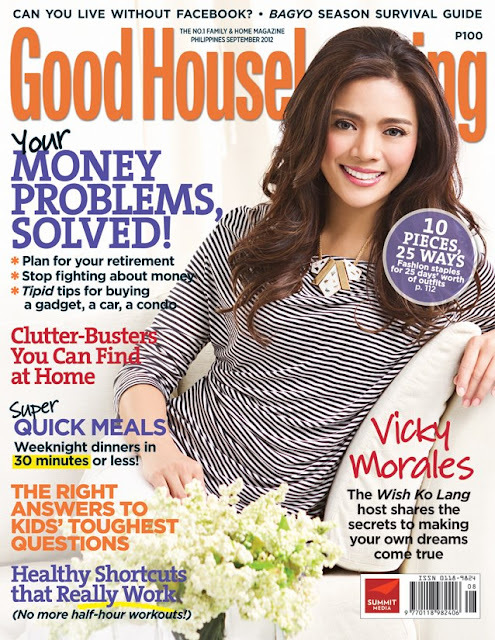 GMA-7's Wish Ko Lang host Vicky Morales graces the cover of Good Housekeeping Philippines magazine September 2012 issue. The beautiful Vicky Morales shares the secrets to making your own dream come true on the cover story of this month's issue of Good Housekeeping magazine. Other features inside the issue include solutions to your money woes, get recipes for meals you can prep in 30 minutes (or less! ), read about health shortcuts that work (like what you can do instead of working out for 30 minutes every day), and much, much more! Grab your own copy now for only P100.00!